Endearingly referred to as the "Mayor of Waimate," by event commentator Brian "Stotty" Stott - and one of the south's adopted champs, South Canterbury teenager Dylan Kennett impressed in his UCI World Cup debut, settling for fourth place in the individual pursuit in Scotland on Sunday 18 November. 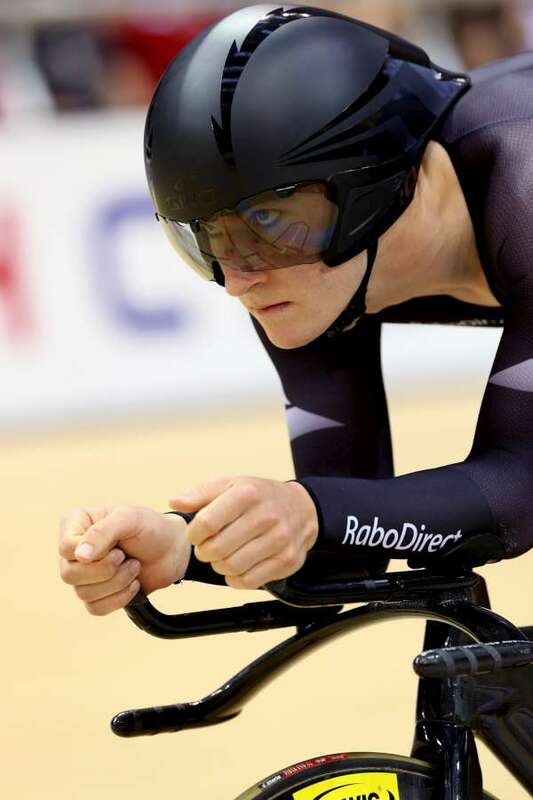 Kennett, from Waimate, was fourth fastest in heats of the 4000m individual pursuit in an excellent 4:28.128 but could not better that in the medal ride against Spain’s David Muntaner Juaneda at the Sir Chris Hoy Velodrome in Glasgow. It was the first time the 17 year old world junior championship silver medallist has competed over the 4000m distance in open competition. Muntaner Juaneda was also unable to better his morning ride, clocking 4:28.429 while Kennett managed 4:31.987. “Backing up at this level was the challenge for a young rider like Dylan. He didn't have the legs in final and was not able to get on schedule from start,” said BikeNZ coach Dayle Cheatley. “He showed good fight in last kilo and I think he can be happy with making a final ride in his first world cup and riding a very solid qualifying effort. That was the same time Jesse Sergent did in his first international ride five years ago. Olympic omnium gold medallist Lasse Norman Hansen (Denmark) took out the gold medal in 4:20.875 with a comfortable win over Ireland’s Martyn Irvine. Kennett, BikeNZ’s only rider at the World Cup, returns home later in the week before heading to Adelaide with the BikeNZ team for the Oceania Track Championships starting on Wednesday 28 November. British cycling success at the Olympics has attracted large and exuberant audiences to the new velodrome, to be used for the 2014 Commonwealth Games, although local success has not been easily attained. In men’s competition Great Britain’s only medal so far has been a silver in the team sprint behind Germany, with their hopes resting on double Olympic gold medallist Jason Kenny in the keirin later today and sprint tomorrow. The women are more prominent, winning the team pursuit over Australia and team sprint, with strong chances in keirin and sprint. Men 4000m individual pursuit, qualifying: Lasse Norman Hansen (Denmark) 4:22.373, 1; Martyn Irvine (Ireland) 4:24.243, 2; David Muntaner Juaneda (Spain) 4:26.479, 3; Dylan Kennett (New Zealand) 4:28.128, 4. Gold medal: Hansen 4:20.875, 1; Irvine 4:22.745, 2. Bronze medal: Muntaner Juaneda 4:28.429, 3; Kennett 4:31.987, 4.